Each week, the Graduate School will feature a graduate student or postdoc who exemplifies exceptional leadership and communication skills both inside and outside of the classroom. The Wolf of the Week student will share research, personal NC State anecdotes and some tips for success. By sharing these stories, we encourage our campus community to celebrate graduate students and postdocs who represent the diversity of programs and projects that can be found on campus. To view more stories, visit the Wolf of the Week page. Tim Becker is a Masters student in the English department, and his research focuses on epistemology in the teaching of writing. In addition to being a Graduate Teaching Assistant, Tim has led his own workshops on how to use writing in teaching for The Graduate School’s professional development initiative. 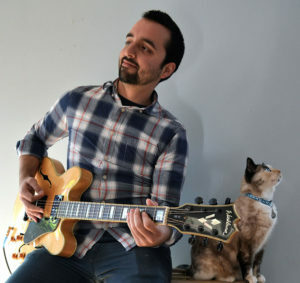 Musician and graduate student Tim Becker poses with his cat. Can you tell us about your research/teaching experience? I discovered my knack for teaching in industry rather than academia, facilitating employee training events and public technology workshops. Here at NC State, I’m a Graduate Teaching Assistant in the English Department’s First-Year Writing Program. Most of my research involves issues related to epistemology in the teaching of writing. We take writing for granted and often forget that our knowledge practices and human society in general could not exist as they are without it. What do you like the most about NC State? NC State’s English department recognizes the importance of preparing teachers of writing with robust theoretical knowledge founded on peer-reviewed research. The department invests in course work, professional development opportunities, and a mentoring program designed to equip teachers with the knowledge and skills to bring greater value to the most universally required courses in the country. What is something that you have learned from the Teaching and Communication Certificate that you’re applying to your work or teaching? My biggest takeaway has been to diversify my methods of instruction to engage students of all learning styles and make the classroom a dynamic and interactive learning environment. In the Teaching and Presentation Practicum development series, participants had the opportunity to design, deliver, and receive feedback on several micro-lessons over the course of a semester, with each week dedicated to a different type of instruction. I’ve been a musician for half my life, but after learning all about composition theory in my first semester here, I realized I held several false beliefs about making music that students often have about writing. Giving up these bad ideas and bringing new approaches from the theory classroom to my music practices has changed my life! I recorded and released my debut album at the end of last semester and have another one coming out later this summer.